Maize bran is a by-product of various maize processing industries, including starch and ethanol production, and the production of maize-based foods. While maize bran theoretically consists of the bran coating removed in the early stages of processing, the maize bran sold for livestock feeding is usually a mixture of the bran fraction and other by-products and is, therefore, a very loosely defined product of highly variable composition. In the case of ethanol production, maize bran is defined as the mixture of the bran fraction and distillers solubles (Kalscheur et al., 2012). In the starch extraction process, maize bran is usually mixed with steep liquor to produce corn gluten feed. 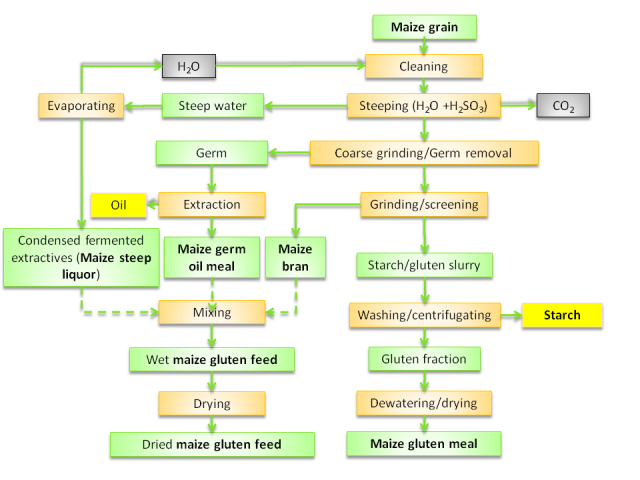 In the production of maize grits by the dry milling process, maize bran is mixed with broken kernels, germ residue after oil extraction, and inseparable fractions of germ, pericarp and endosperm to produce hominy feed (Stock et al., 1999). Maize bran and hominy feed are presented together in this datasheet since both products are closely related and form a continuum in terms of chemical composition. It must be noted that hominy feed is sometimes referred to as "hominy" (see for instance Leeson et al., 1988) although hominy is a distinct food product, and not a by-product. Maize bran and hominy feed are feed commodities traded worldwide. However, while maize bran is often mixed with other maize processing by-products in industrialized countries, it is a major commodity in developing countries. In Malawi, for instance, maize bran is in high demand both for human and livestock consumption, and can become scarce and expensive (Mulumpwa et al., 2009). Maize bran usually contains less than 10% oil in the DM. Ash content is about 6% DM and similar to that of corn gluten feed and DDGS (dried corn distillers grain with solubles), but more variable. Hominy feed is comparable to maize bran but less variable and richer in protein (15 vs. 12% DM in average) and starch (40 vs. 35%), and poorer in fibre (crude fibre 6.5 vs. 12% of DM), and, therefore, of a higher nutritional value. In the USA, hominy feed is required to contain more than 4% fat (as fed) (AAFCO, 2002). In temperate countries maize grain intended for the human market should be free of mycotoxin contamination, and the by-products yielded by these processes are themselves of high quality (Blair, 2008). In tropical countries, maize bran may be highly contaminated with mycotoxins, particularly during the hot rainy season (Rava, 1996; Scudamore et al., 1998). In Tanzania, in a survey of maize bran intended for poultry feeding, 50% of the samples were positive to aflatoxin B1 and 20% had more than 20 ppb (parts-per-billion) of that toxin (Kajuna et al., 2013). Maize bran and hominy feed are primarily used as sources of energy for ruminants. They are less expensive than maize grain and, depending on their chemical composition, their nutritional value may allow a performance slightly lower, equal to, or even better than the whole grain. The cell wall content of maize bran varies widely, which affects digestibility and energy content, despite the fairly good digestibility of maize cell walls. The digestibility of maize bran (76% TDN in NRC, 2001; 70% OM digestibility in the INRA-AFZ Tables, Sauvant et al., 2004) is generally considered to be about 89% that of corn gluten feed and 80% that of maize grain. The ME content of maize bran is approximately 90 and 80% of the ME of corn gluten feed and grain, respectively. Hominy feed containing 5-8% fat and 20% starch was found to have 87% of the energy value of maize grain in steers (Larson et al., 1993). In wethers fed at maintenance, the NE for gain of wet corn bran was estimated at 6.7 MJ/kg DM (Fiems et al., 1996), a value consistent with the EN value for growth of 6.5 MJ/kg DM proposed by the INRA-AFZ tables (Sauvant et al., 2004). In growing bulls, ensiled maize bran had a positive effect on energy efficiency when it replaced 40% of maize silage (DM basis), and it was concluded that its in vivo OM digestibility was underestimated (Fiems et al., 1996). In finishing steers, maize bran from ethanol production (a mixture of bran and solubles) was found to have 100-108% of the energy value of maize, which could be explained by negative digestive interactions induced by dry-rolled maize in the control diet (Bremer et al., 2005). However, substituting dry-rolled maize and steam-flaked maize with regular maize bran decreased the gain:feed ratio by 5.2 and 13.8%, respectively (Macken et al., 2004). Maize bran, like many maize by-products, has a rather low effective protein degradability (43%, Sauvant et al., 2004), and can be considered as a medium provider of metabolizable protein (7.7 in NRC, 2001 and 10.3 % DM in the INRA-AFZ tables (Sauvant et al., 2004)). However, it is likely that protein degradability of maize and hominy feed actually depends on the process undergone by the grain during wet or dry milling. Maize bran can be used to fully replace maize in the concentrate fed to cows of medium level of production without affecting milk quality (Cardenas et al., 2002; Tahir et al., 2002). However, maize bran has to be combined with a protein supplement. In Tanzania, sunflower meal mixed with maize bran was effective in increasing milk yield during the dry season (Mlay et al., 2005). One advantage of maize bran is that it provides energy without causing negative digestive interactions with other ingredients. In Kenya, supplementation of elephant grass (Pennisetum purpureum) with 1 kg DM of maize bran did not significantly reduce the rumen degradation of the forage. It also increased the molar proportions of propionate, which may have increased the efficiency of utilization of ME and, therefore, milk production (Muinga et al., 1995). In the USA, the inclusion of 10 to 25% maize bran in the diet had a positive influence on energy intake and milk production (Janicek et al., 2007). When maize bran replaced dried ground maize grain in the concentrate portion of high-forage and low-forage diets, total replacement reduced OM intake, milk yield, milk energy, and milk protein. A strategy in which maize bran only partially replaces ground maize and part of the forage may be preferable (Arndt et al., 2014). Hominy feed with a composition close to that of maize grain could be used as an energy source alone or in combination with maize in dairy cows fed sorghum and ryegrass silages (Boyd et al., 2008). Likewise, hominy feed containing 47% starch (DM) could be used as the main energy supplement (28-35% diet DM) offered to mid-lactation cows fed maize and ryegrass silages, resulting in similar performance as that obtained with ground maize or steamed-flaked maize (Cooke et al., 2009). In Australia, pellets including 60% hominy feed and 34% wheat pollard were an effective replacement for sorghum grain in dairy cows fed tropical grass pasture in autumn. As they were highly palatable, they increased milk production and profit margins (Ehrlich et al., 1992). In the USA, maize bran from wet milling fed to cattle at 15 or 30% (diet DM), either alone or in combination with steep liquor, increased DM intake and average daily gain, compared with a predominately dry-rolled maize diet. Maize bran also reduced acidosis, but there was a tendency for it to reduce digestibility and dietary energy (Scott et al., 1997). In finishing steers, maize bran from ethanol production (a mixture of bran and solubles) included at up to 45% of DM improved final weight, average daily gain, DM intake and feed:gain ratio compared to a blend of high-moisture and dry-rolled maize (Bremer et al., 2005). The same type of maize bran replaced maize in beef growing and finishing diets at up to 40% inclusion levels with no loss of performance (Buckner et al., 2007; Larson et al., 2007). A combination of maize bran and steep liquor fully replacing dry-rolled maize did not alter feed efficiency in growing cattle, and, as in the study of Scott et al., 1997, slightly decreased OM digestibility and increased the rumen pH (Sayer et al., 2013). Maize bran from ethanol production fed to finishing steers up to 45% of the diet resulted in a similar performance to that obtained with the same amount of DDGS (Bremer et al., 2005). Hominy feed containing 5-8% fat and 20% starch was substituted for up to 45% of the maize grain in cattle finishing diets without compromising performance (Larson et al., 1993). Farmers in developing countries often use maize bran as a supplementary feed for small ruminants, at inclusion rates ranging from 10 to 25% of the total diet (Katongole et al., 2009). Maize bran is particularly valuable when used with poor forages. In Kenya, goats fed a diet of Rhodes grass (Chloris gayana) hay had better performance and nutrient digestibility when the diet was supplemented with Gliricidia sepium and maize bran, the maize bran allowing a better utilization of gliricidia (Ondiek et al., 1999). Likewise, in Tanzania, goats grazing star grass (Cynodon nlemfuensis) benefitted from leucaena supplementation when maize bran was included in the diet (Mjema-Mweta et al., 1995). In Nigeria, feeding maize stover plus urea and 150 g/d of maize bran provided adequate and profitable live-weight gain in goat kids during the dry season (Yahaya et al., 2013). Maize bran and hominy feed can replace more or less completely maize grain in pig diets, depending on their composition. Hominy feed, particularly, is considered an excellent feed for pigs (Blair, 2007). In some developing countries, maize bran is a major ingredient for smallholder pig feeding, as reported for example from Tanzania (Karimuribo et al., 2011) and Chad (Mopaté et al., 2011). However, maize bran and hominy feed have variable amounts of starch, fibre and fat that all affect their energy value for pigs. In two comparisons of maize by-products in the USA, maize bran had one of the lowest ME value (12.4-12.9 MJ/kg DM) corresponding to 78-80% of maize grain (Anderson et al., 2012; Liu et al., 2014).This value was higher than the ME value of 8.2 MJ/kg DM (51% of maize) reported by the INRA-AFZ tables (Sauvant et al., 2004). Hominy feed was found to have a ME value of 15.4 MJ/kg corresponding to 94% that of maize (Rojas et al., 2013). In Nigeria, maize bran included at 25% in the diets of growing pigs gave the best average daily gain and the second best profit (after brewers grains) in a comparison of several by-products (palm kernel cake, wheat offal, rice bran and brewers grains) (Akinfala et al., 2014). In Spain, hominy feed included at 12-12.5% in the diet of growing and finishing pigs, in partial substitution to sorghum and barley, did not affect growth performance, carcass yield and meat quality (Moset et al., 2013). In the USA, the inclusion of up to 37.5% (as fed basis) hominy feed in the diet of finishing pigs in partial substitution for maize resulted in reduced daily gain and feed intake: this decrease in performance should be considered when deciding if it is cost-effective to include hominy feed in finishing diets (Potter et al., 2009). Maize bran and hominy feed can be used as a partial replacement for maize grain in poultry diets, depending on their composition. Hominy feed, particularly, is considered an excellent feed for poultry (Blair, 2008). Maize bran is frequently cited in the scientific literature as a major ingredient for poultry in Africa and Asia (Malawi, Gondwe et al., 2007; Nigeria, Iyayi et al., 2005; Ghana, Donkoh et al., 2009; South Africa, Swatson et al., 2003; India, Byju et al., 2012; Iran, Manafi et al., 2011). Because maize bran and hominy feed contain more fibre than maize grain, enzyme supplementation can help to some extent in improving performance in birds fed significant amounts of both products (Kaczmarek et al., 2009; Manafi et al., 2011; Ademola et al., 2012; Ademola et al., 2013). The energy value of maize bran and hominy feed is variable, and depends on the composition of the product. In a trial with broilers in the USA, high-fat hominy feed (fat 7.7% DM) was found to have a ME value (15.6 MJ/kg DM) identical to that of maize grain, resulting in similar growth performance in broilers and turkey poults. However, low-fat hominy feed (fat 2.4%) had a lower ME (13.6 MJ/kg DM) and depressed growth (Leeson et al., 1988). In Brazil, an ME value of 14.3 MJ/kg DM was obtained in broilers with high fat hominy feed (fat 14.6% DM) (Santos et al., 2013). In Ghana, a much lower value of 10.5 MJ/kg was reported for maize bran (Donkoh et al., 2009). In India, maize bran included at up to 7.5% in a broiler diet produced significantly higher body weight and ready-to-cook carcass weight, with a better return over feed cost. The addition of an enzyme was unnecessary (Byju et al., 2012). In Indonesia, low-fat hominy feed (3% as fed) was included at 18% in broiler diets (replacing 33% of maize) without depressing performance, but higher rates were detrimental (Kompiang et al., 1998). In Nigeria, the inclusion of 40% maize bran in partial substitution for maize grain in broiler diets was found detrimental to weight gain and feed conversion, but increased general acceptability of the broiler meat (Iyayi et al., 2005). However, in Iran, maize bran was incorporated in broiler feed at 40% of the diet, with an enzyme supplement, without any deleterious effect on the birds (Manafi et al., 2011). In Poland, broilers fed diets where hominy feed replaced 50 to 100% of the maize had lower growth and feed conversion rates, but enzyme supplementation improved feed conversion rate and nutrient digestibility (Kaczmarek et al., 2009). In Nigeria, with heat-stressed broilers fed diets including 3% (starter) and 20% (finisher) maize bran, enzyme supplementation only improved the feed conversion ratio (Ademola et al., 2013). In Nigeria, including 30% of maize bran in a layer diet based on maize and groundnut meal did not alter egg production rate and feed per kg egg, but improved egg size and other egg characteristics except shell thickness (Odunsi et al., 2002). In a comparison of several laying diets based on cereal brans, with or without enzyme supplementation, a diet based on enzyme-supplemented rice bran (25%) and maize bran (30%) gave the best hen-day production and feed conversion ratio (Ademola et al., 2012). In many tropical countries, the local maize bran is considered as a traditional feed ingredient for growing rabbits, for example in Nigeria (Adenyia et al., 2010; Njidda et al., 2011), Burkina Faso (Hoffmann, 1990), Benin (Lebas et al., 2012), Tanzania (McNitt, 1979) and Brazil (Oliveira et al., 2008). It is also used to feed breeding does (Hoffmann et al., 1993). It was used, without any deleterious effects, at up to 35% of the diet (Onakpa et al., 2006); it is also included within this range in many reference or control diets (Aderemi et al., 2010; Ajasin et al., 2006; Togun et al., 2009). In some experimental studies, maize bran was safely incorporated at up to 65% in the control diet (Sarwatt et al., 2003). In a cafeteria feeding system with a choice of ingredients offered to rabbits, maize bran was offered ad libitum without problems and accounted for up to 50% of total DM intake. Nevertheless, maize bran contaminated with mycotoxins may impair rabbit performance (Muir et al., 1996). The nutritive value of maize bran is close to that of cereals, with a calculated digestible energy value of about 13.7 MJ/kg DM, representing about 90-95% of that of cereals, and with a high protein digestibility (about 83-84%) (Lebas, 2013). Even if the protein content remains clearly below rabbit requirements for growth or reproduction, it must be pointed out that the amino acid composition of these proteins is higher than recommendations for sulphur-containing amino acids or threonine (+15 to 17% ) and just below recommendations for lysine: -10% only, to be compared to the protein of maize grain (-33%). 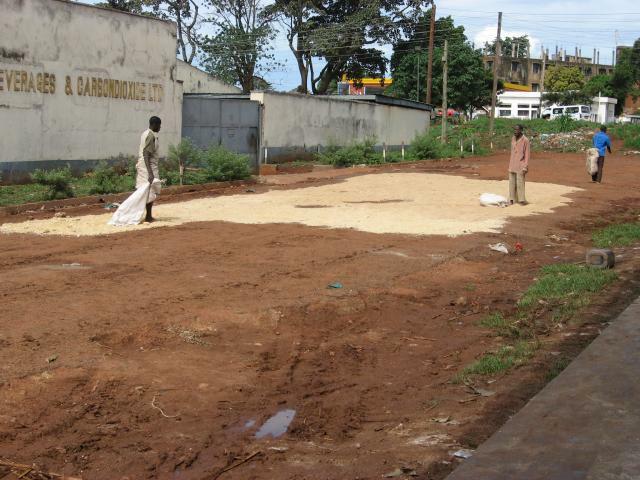 Maize bran is one of the main ingredients used by tilapia farmers in sub-Saharan Africa (El-Sayed, 2013). In Kenya, a comparison of maize bran, rice bran and wheat bran fed to Nile tilapia fingerlings (Oreochromis niloticus) at 1.5% body weight showed that maize bran gave the best performance, but wheat bran gave the best economic returns (Liti et al., 2006). In Malawi, with Tilapia rendalli fingerlings, a comparison of maize bran and rice bran as energy supplements to soybean meal-based diets concluded that maize bran supplementation gave better performance than rice bran (Mulumpwa et al., 2009). In channel catfish fed increasing amounts of maize bran (up to 30%) in substitution for maize grain, the optimal level of maize bran for best weight gain was about 10% (Li et al., 2012). In juvenile cichlids Sarotherodon melanotheron, maize bran was a more suitable feed than chicken droppings and wheat bran. Survival rate with the by-products was lower than with commercial feeds (Ouattara et al., 2005). NRC, 2007. Nutrient requirements of small ruminants: Sheep, goats, cervids, and new world camelids. National Academy Press, 384 p.